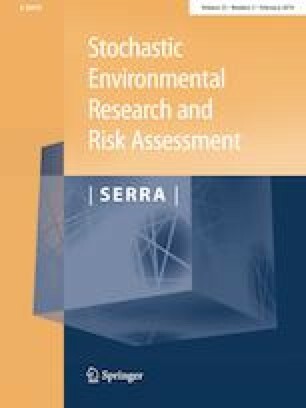 A comprehensive fuzzy-stochastic risk assessment method is adopted to systematically quantify the stochastic and fuzzy uncertainties related to discharge conditions, environmental standards and health assessment criteria. A sequential Monte Carlo simulation of pollutant behaviour in rivers after the accidental discharge from multiple risk sources is carried out using a risk probability analysis model of sudden water pollution. The fuzzy membership functions based on environmental water quality standards and health impact criteria are established by means of a questionnaire. Then, the simulation results and the membership functions are combined to quantify the stochastic uncertainty of the pollutant concentration and the fuzzy uncertainty of its consequences. Based on the fuzzy logic method, the general risk level is obtained by combining the risk based on the environmental water quality standard and the health risk, and the general risk scores (CS) are obtained via the interpolation method. The risk assessment method is applied to the Yixing area. The results show that (a) the ammonia nitrogen CS values are low in the upper reaches and high in the middle and lower reaches. The ammonia nitrogen CS values under sudden schemes are not less than the corresponding values under the stable scheme. (b) The dynamic concentration changes in the sub-reach affect the probability of exceeding the ammonia nitrogen standard and indirectly affect the changes in the CS values in different reaches. (c) The net variation in the ammonia nitrogen CS values exhibits a concentrated distribution of high and low scores in the upstream areas and a concentrated distribution of high scores in the downstream area. (d) For most of the sections, there is a positive linear correlation between the risk growth rate (GR) and the average duration of the accidental state, and the greater the GR value is, the more sensitive the section is to the accident risk. This research was supported by the project (41471014) sponsored by the National Natural Science Foundation, China.